Warning: Spoilers for book 1 in the Chronicles of Prydain, The Book of Three, (and fairly major ones at that!) lie below. A year after the defeat of the Horned King, Taran the Assistant Pig-Boy has returned to Caer Dallben. 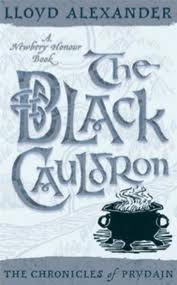 The time has come, however, for a brave band of allies to try to stop the birth of the Cauldron-Born warriors by destroying the infamous Black Cauldron. Gwydion calls allies to a council held by Dallben, and forges a team of companions to go on this perilous quest. In addition to Taran's friends from the first book, he's joined by Adaon, son of the chief bard, and Ellidyr, a brave but arrogant prince. Can they overcome terrible danger to triumph against all odds? As I mentioned when reviewing book one, I enjoyed it but it wasn't particularly memorable and I can see why the details had slipped my mind in the many years since reading it. On returning to this one, I'm unsure as to how on earth I could remember so little about it - in fact, I'm starting to wonder if I actually have read it before or not - as it has a fantastic plot and some really strong characters. In addition to the ones I really liked from the Book of Three, Doli of the Fair Folk and the wandering bard Fflewddur Fflam grow as characters during this book. Of the newcomers, Ellidyr stands out as a superb character and the tension between him and the lowly Taran is very well handled. We also have some adversaries who are significantly more interesting that the Horned King here, in various forms. Additionally, the plot has moved from seeming a little derivative of Lord of the Rings to being far fresher, taking influences from Welsh mythology which readers are much less likely to be familiar with. Finally, the ending is absolutely stunning - it's perhaps a tiny bit predictable but so well written that I can't really criticise it for that. With the improvement in characters and plot, along with the same enjoyable writing style as we saw in the first book, this is a strong recommendation. I'm certainly looking forward to getting the other three books in the series! For more classic fantasy, you should certainly take a look at The Snow Spider by Jenny Nimmo.